The 0.91 ERA advantage enjoyed by the relievers in 2011 was one of the largest gaps in favor of the bullpen over the last 38 seasons, but, during the Joe Girardi era, that has been par for the course. In all four seasons as manager, Girardi’s relief corps has posted a lower ERA than his starting staff, which supports a widely held perception that bullpen management is one of his strong suits as a manager. Then again, since 1974, only four Yankees’ teams have featured a rotation with an ERA lower than the bullpen, so the trend actually dates back long before Girardi. Although a strong bullpen can definitely hide the flaws of a shaky rotation, when the components of a pitching staff get too far out of balance, the result usually isn’t positive. For example, in four seasons, the Yankees’ bullpen posted an ERA that was one run lower than the starting staff, and in all but one, the team finished under .500. A similar relationship also exists when looking more broadly across major league baseball. 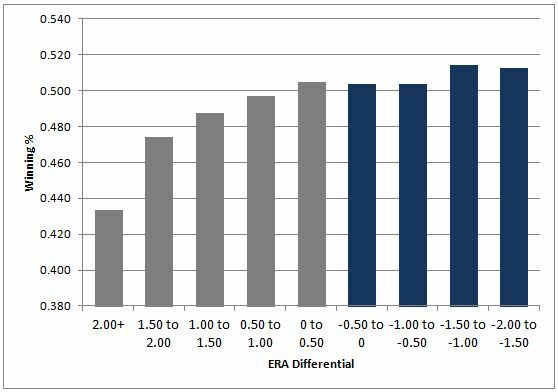 On average, the stronger a team’s relievers get relative to their starters, the less success it usually has. Of course, that trend is being driven by rotation ERAs that are so high, even a mediocre bullpen would shine in comparison. Note: 1981 and 1994 strike years omitted. 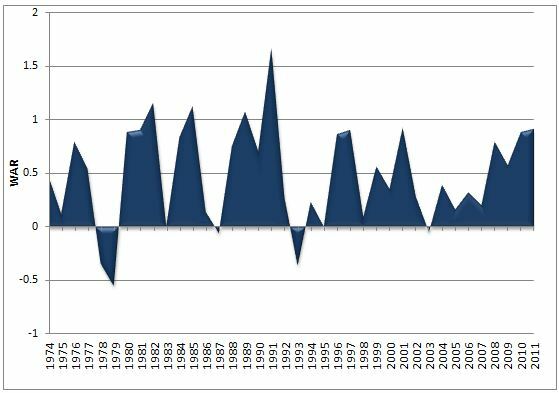 A negative differential (blue bars) indicates starters had a lower ERA; a positive differential (gray bars) indicates relievers had a lower ERA. One variable that impacts any comparison between bullpen and rotation is innings. Since 1974, on one extreme, Billy Martin’s 1980 Athletics logged 1,051 more innings from their starting staff (much to the dismay of Mike Norris and Brian Kingman), while at the other end of the spectrum, Sparky Anderson’s last Tigers team managed fewer than 200 more innings from the rotation. In 1995, Captain Hook lived up to his nickname as no starting pitcher surpassed 150 innings. At least Tigers’ starters managed a fWAR of 6.1 in Anderson’s last season. Since 1974, the 2007 Nationals had the only rotation to yield a negative rating. In the bullpen, negative fWAR contributions are much more common, so the strong positives really standout. Although no relief corps in the period under consideration has exceeded 10 fWAR, five teams have come within one win. The 2006 Twins’ total of 9.7 tops the list, but the Yankees’ 1996 bullpen, which featured Mariano Rivera setting up John Wetteland, is not that far behind. In terms of WAR differential, the 2011 Phillies’ starters contributed 24.1 more wins above replacement than its relievers, the highest total since 1974. Once again, however, don’t blame the bullpen. 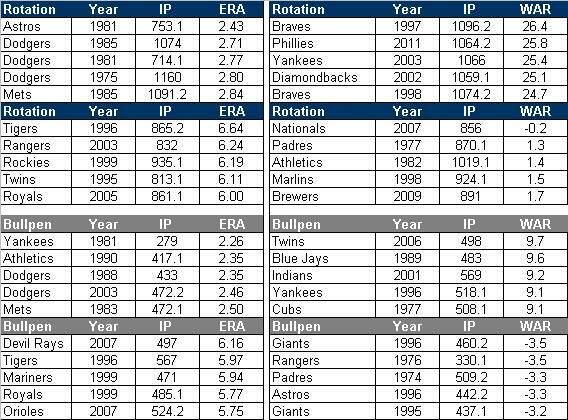 Only the 1997 Braves had a higher fWAR from its rotation (the 2003 Yankees had the third highest total). Not surprisingly, the aforementioned 2007 Nationals’ rotation sports the largest fWAR deficit at 2.6, but three other teams also had a season in which its relievers contributed more to winning (or, perhaps more accurately, contributed less to losing). 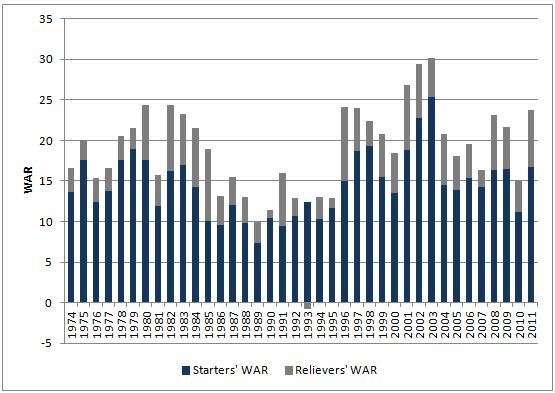 A negative differential indicates starters had a lower ERA; a positive differential indicates relievers had a lower ERA/fWAR. The reverse is true for fWAR. Even if the Yankees enter the 2012 season with the rotation as it exists today, the team’s starter do not seem to be in jeopardy of being added to any of the ignominious lists mentioned above. However, the bullpen could end up making its mark with a very positive accomplishment. Undoubtedly, Brian Cashman will continue to search for a quality upgrade in the rotation, but even if one is not forthcoming, the entirety of the team’s pitching staff could be more than capable of another very successful season.